The Breville 800JEXL is the best centrifugal juicer on the market. It is the best quality juicer you can find if you have your heart set on a centrifugal juicer. Of course it will operate differently from a masticating juicer. However, you should first decide what type of juicer you need - whether it's centrifugal, masticating or twin gear - and then you should decide on the particular juicer. If you've made up your mind that you want a centrifugal juicer, then buying a Breville juicer is always a good bet. Breville juicers are some of the best quality juicers around and the Breville 800JEXL Elite Juice Fountain is really the best juicer that Breville makes. It is solidly constructed and easy to use. At 1000-watts or 1-1/3 horsepower, it is extremely powerful and makes a liter of juice in just five seconds. Compare this with a masticating or twin gear juicer which needs five minutes to make a liter of juice! The Breville 800JEXL comes with a "smart chip" which automatically regulates how much power is transferred to the blades when juicing. One of the first things you'll notice about this juicer is its glamorous stainless steel exterior. The juicer is well-styled and looks beautiful - it would make a great gift and would look great on anyone's countertop. The Breville comes with a choice of two speeds, a safety locking arm, a juicer cover, a stainless steel micro mesh filter basket, a juice jug and froth separator and a food pusher and cleaning brush. The 800JEXL features titanium-plated stainless steel blades and an extra large 3" feed chute. The size of this feed chute means that you don't need to waste time chopping up your fruits and veggies into tiny pieces. Most juicers only have a 1.5" feed chute, so the 3" chute means that the entire process of making juice is much quicker. The chute is so large that you can even throw in a whole apple and still make amazing apple juice. 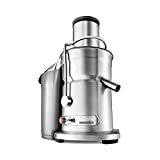 The Breville is a centrifugal juicer which means that it will operate differently from masticating or twin gear juicers. One of the major differences is the fact that the centrifugal juicer will not be able to make green juices from leafy vegetables or wheatgrass. So if you'd like to make green juices on a regular basis you are better off opting for a masticating juicer or twin gear juicer. Breville offers a number of juicer models which are all relatively popular but they differ slightly in price and features. The best price Breville 800JEXL that you'll find will generally cost around $300 online. You can find a cheap Breville BJE200XL which is a smaller and less powerful unit for around $100, whereas a budget Breville BJE510XL will usually cost around $200. The features all vary slightly, hence the price difference. 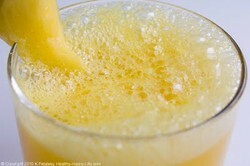 At the end of the day though, the Juice Fountain Elite is really one of the top end, powerful juicers. It is a simple process to use this machine and it's just as easy to clean.